Are you intentional about seeking God's desire for your future? Then pray for your husband-to-be! Sharing personal stories, insightful reflections, practical applications, relevant Scripture, and heartfelt petitions, Robin Jones Gunn and Tricia Goyer encourage you to begin your loving relationship with your spouse by supporting him in prayer---even if you haven't met him yet. 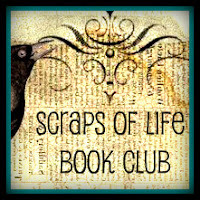 Scraps of Life Book Review: I was excited at the opportunity to read this book for two reasons. First off, I was familiar with the authors work and eager to read more. Secondly, I'm the mom of three girls. This book really hit home. I appreciated the honesty of the authors. They both opened up and shared their stories of their life which included the mistakes and the right turns along the way. I loved the practical, hands on information given for the reader to follow along and it bridges a gap in the mother-daughter relationship when it comes to discussing dating and seeking a life long commitment to one man. This is a wonderful book for a mom to read and then pass along to her unmarried daughter. I look forward to sharing this with my daughters. Thank you, Robin and Tricia for writing this book. Are you on twitter? Then follow @RobinGunn and @triciagoyer. I was given a copy of the book to read through LitFuse Publicity Group. Our own opinions are expressed in the review.